Have you heard of Tim Tams? No? Well, I hadn't heard of them either until I heard one of our professors--from Australia, of course--gave them away before our major exams. I have yet to win a package of Tim Tams, but one of our local international food stores sells them, so I've tried them out (on several occasions, admittedly). You can guess what's coming next: they are so. good. Rest assured that I am not alone; even Scout agrees with me. My sister Hannah had been out shopping and had thoughtfully picked me up some of the caramel-filled Tim Tams while she was out. She stopped by briefly to drop them off late one evening and laid them down on the coffee table in my family room. We exchanged a few words and a quick hug and were both off to bed. 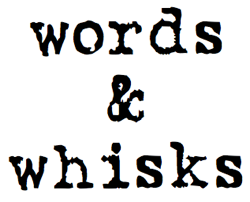 Now, recently I've had some long work days; I will be gone by 6:15 and won't be back until upwards of 4 o'clock. Accordingly, Nick will generally stop by on his lunch break to let Scout out for a little walk. Well, that day I left the Tim Tams on the coffee table, and Nick (allegedly) came to let Scout out the Tim Tams on my coffee table had been nice and neatly ripped open with its contents nearly devoured. She left one cookie in the packaging, of course--like the polite little girl that she is. Most fortunately, she experienced none of the side effects that eating 1,000+ calories worth of sugar might be expected to elicit in a 40 lb dog. Nevertheless, to make up for Nick's Scout's cookie binge, I'm sharing this salad. 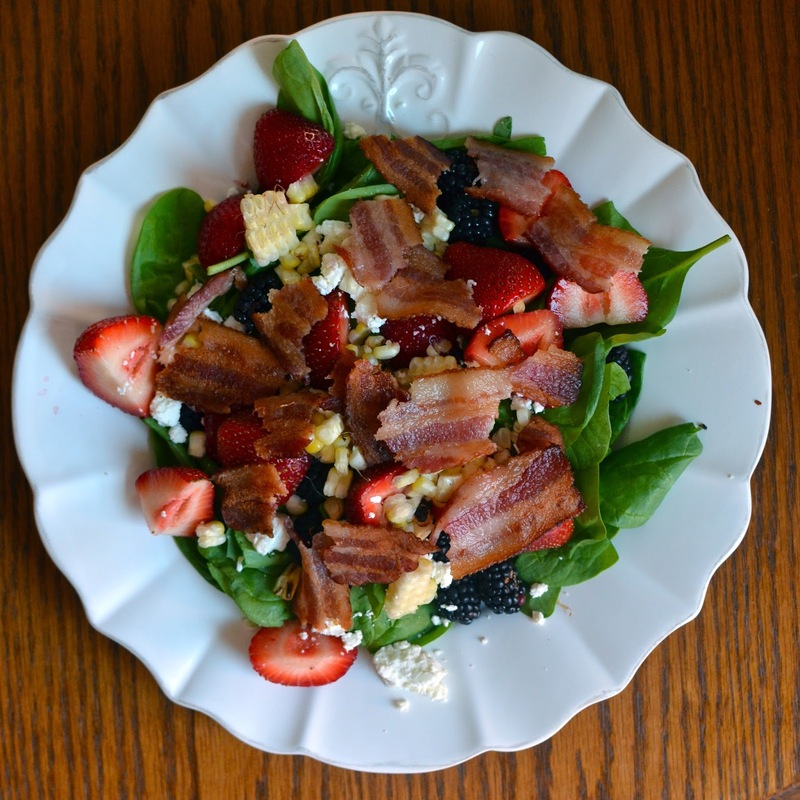 Not just any salad, mind you, but one filled with so many of the best (aka my favorite) fixings: fresh berries, crispy thick cut bacon, charred sweet corn, tangy goat cheese, and a honey-laden dressing. Grill corn over medium heat on a gas grill until charred. Remove from grill and slice corn from cob when cool enough to handle. Set aside. 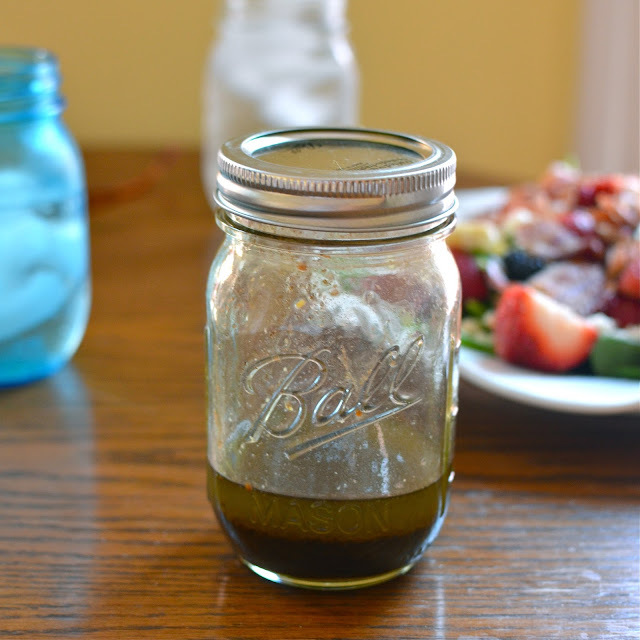 Make salad dressing by combining olive oil, balsamic vinegar, honey mustard, honey, salt, and pepper in a mason jar or other lidded container. Shake until combined (always shake immediately before using). Assemble salad by dividing the spinach between two plates. 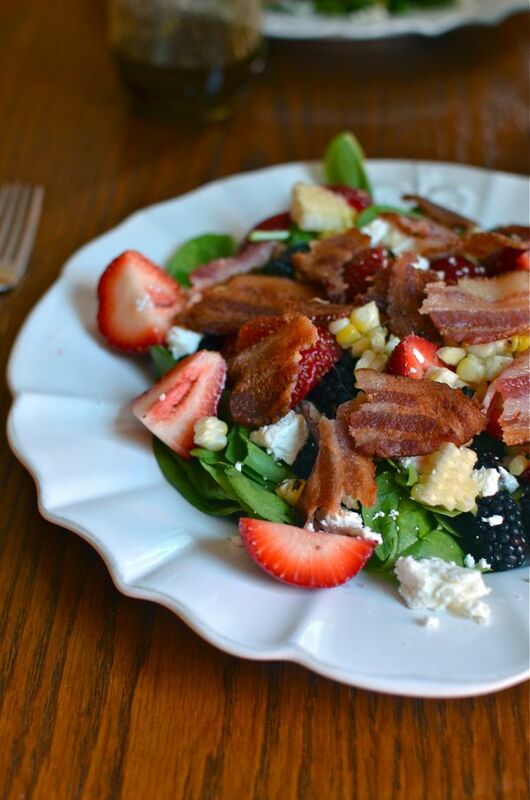 Divide the blackberries, bacon, corn, and strawberries between the two salads. 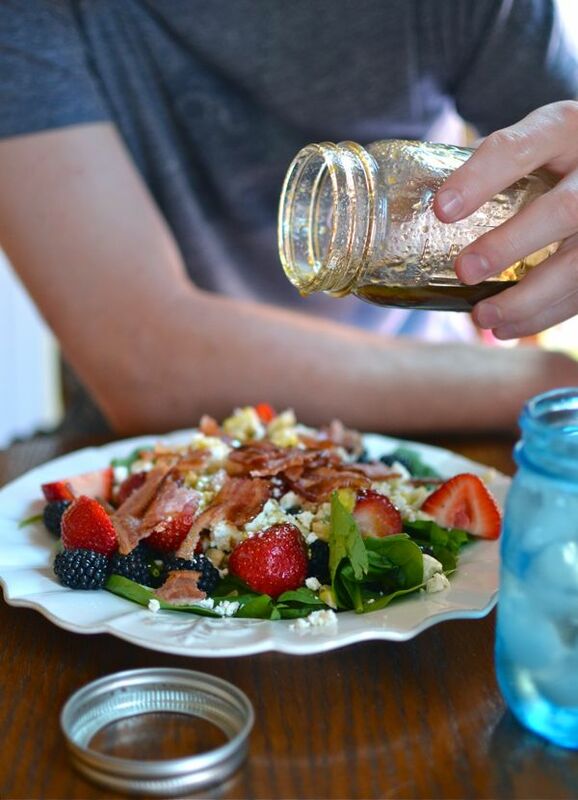 Drizzle generously with the honey vinaigrette and serve with a glass of sweet tea or lemonade. And, since you've been so healthy, follow it up with some dessert! I'm still pretty convinced that Nicholas ate the cookies!